After several years of refinement we are introducing our latest set of improvements all bundled up in one new sensor, the OxyProbe® II. The D545-VP has a right-angled T-Pull VarioPin connector. The new membrane design is modeled after our successful 25 mm membrane cartridge. It has an expandable inner Silicone bladder that holds the electrolyte within a 316L stainless steel cage. During SIP processes or during autoclaving the electrolyte turns to steam, but does not distend the measurement membrane because the internal bladder expands first, taking the pressure off the sensitive measurement area. 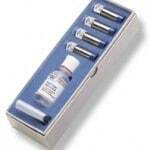 This allows us to have a maximum of electrolyte present, with minimum risk of damage to the sensor. The new membrane cartridge design is easy to use and durable enough to be used many times over if necessary. 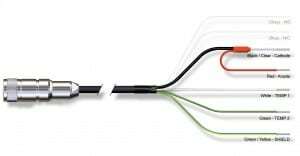 The D545-VP (12mm) Oxyprobe II Dissolved Oxygen Sensor offers the exact same functionality as the D545 but instead of our right-angled standard D9 connector it has a waterproof T-Pull (right-angled) VarioPin connector for VarioPin assemblies. It is also available with a straight VarioPin connector. Available with either waterproof VarioPin or D9 connector. This T-Pull connector version allows for easy removal from the fermenter and reduces strain on cable. Decide whether a right angle connector is preferred or a straight connector. It is important to regularly maintain the sensors by inspecting and calibrating them. 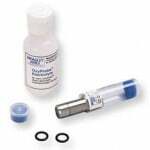 The membrane cartridge (see Accessories tab for relevant membrane cartridges) should be checked and refilled prior to every use. Part No. 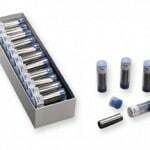 MS29-16 16 membrane cartridges in one easy-to-store box. Internal o-rings and electrolyte must be ordered separately.